Summer shouldn’t mean taking a break from learning, especially reading. Studies show that most students experience a loss of reading skills over the summer months, but children who continue to read will gain skills. Efforts should be made during the summer to help children sustain reading skills, practice reading and read for enjoyment. Reading builds visualization, thinking and language abilities. 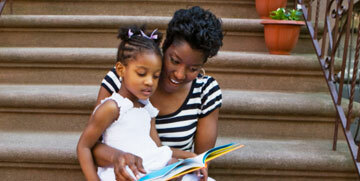 Taking the time to read with your child can help you evaluate your child’s reading skills. If you discover that your child is having trouble with reading, he or she may have a learning disability. 80% of children with a learning disability have difficulty with basic reading and language. But early identification of such a disability gives a child the chance to develop ways to learn how to read effectively, and skills to lead a successful and productive life. A recent National Institutes of Health study showed that 67% of young students at risk for reading difficulties became average or above average readers after receiving help in the early grades. 1. Read aloud together with your child every day. Make it fun by reading outdoors on the front steps, patio, at the beach or park. Also, let your children read to you. For younger children, point out the relationship between words and sounds. 2. Set a good example! Parents must be willing to model behavior for their children. Keep lots of reading material around the house. Turn off the TV and have each person read his or her book, including mom and dad. 3. Read the same book your child is reading and discuss it. This is the way to develop habits of the mind and build capacity for thought and insight. 4. Let kids choose what they want to read, and don’t turn your nose up at popular fiction. It will only discourage the reading habit. 5. Buy books on tape, especially for a child with a learning disability. Listen to them in the car, or turn off the TV and have the family listen to them together. 6. Take your children to the library regularly. Most libraries sponsor summer reading clubs with easy-to-reach goals for preschool and school-age children. Check the library calendar for special summer reading activities and events. Libraries also provide age appropriate lists for summer reading. 7. Subscribe, in your child’s name, to magazines like Sports Illustrated for Kids, Highlights for Children, or National Geographic World. Encourage older children to read the newspaper and current events magazines, to keep up the reading habit over the summer and develop vocabulary. Ask them what they think about what they’ve read, and listen to what they say. 8. Ease disappointment over summer separation from a favorite school friend by encouraging them to become pen pals. Present both children with postcards or envelopes that are already addressed and stamped. If both children have access to the Internet, email is another option. 9. Make trips a way to encourage reading by reading aloud traffic signs, billboards, notices. Show your children how to read a map, and once you are on the road, let them take turns being the navigator. 10. Encourage children to keep a summer scrapbook. Tape in souvenirs of your family’s summer activities picture postcards, ticket stubs, photos. Have your children write the captions and read them and read them aloud as you look at the book together. Reprinted with permission from The Coordinated Campaign for Learning Disabilities.